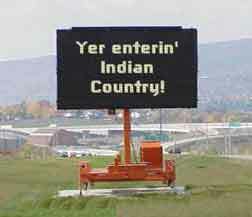 "Indian country was intended to include any unceded lands owned or occupied by an Indian nation or tribe of Indians...."
“Indian country, as used in this chapter, means (a) all land within the limits of any Indian reservation under the jurisdiction of the United States Government, notwithstanding the issuance of any patent, and, including rights-of-way running through the reservation, (b) all dependent Indian communities within the borders of the United States whether within the original or subsequently acquired territory thereof, and whether within or without the limits of a state, and (c) all Indian allotments, the Indian titles to which have not been extinguished, including rights-of-way running through the same." "Land is Indian country if it is part of (1) an Indian reservation, (2) a dependent Indian community or (3) an Indian allotment." "In determining whether land constitutes Indian country, the focus is on what the land is now rather than on what it may become in the future. "Once Congress has set lands apart as Indian country, they remain so until Congress divests them of that character. "Indian lands need not be formally designated as a reservation in order to constitute Indian country." "Any tract of land set apart as an Indian reservation is Indian Country." But the fact that land is not part of an Indian reservation is not determinative if that land qualifies as Indian country as dependent Indian community. "The Supreme Court1 has observed that Congress has defined Indian country broadly to include formal and informal reservations. In other words, the test for determining whether land is Indian country does not turn upon whether that land is denominated reservation but whether the area has been validly set apart for the use of the Indians as such, under the superintendence of the Government." See the Legal Definition of Dependent Indian Community.